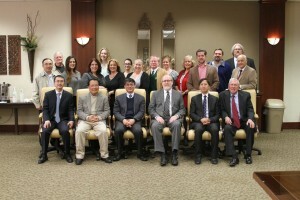 On Monday, February 1, 2015, an academic delegation from East China Normal University visited the campus of Texas State University. Their visit was hosted by the Department of Geography and the National Center for Research in Geography Education. The ECNU delegation met with NCRGE Co-Directors, Dr. Michael Solem and Dr. Richard Boehm, and Geography Professor Osvaldo Muñiz to plan future research collaborations and scholarly exchanges with the NCRGE research coordination network. This new institutional relationship was formalized in a Memorandum of Understanding signed at a reception with several Texas State administrators, faculty, students and staff in attendance. Dr. Min Liu, Professor and Dean of School of Geographic Sciences. Dr. Yushan Duan, Professor of School of Geographic Sciences, Director of the Geographic Education Center. Dr. Minhe Ji, Professor of School of Geographic Sciences. Dr. Bailang Yu, Associate Professor and Assistant to the Dean. The first official collaboration between ECNU and NCRGE will take place in March 2015 when Dr. Solem travels to Shanghai to teach a graduate class based on the GeoProgressions project. ECNU faculty recently completed a Chinese translation of the GeoProgressions research handbook.